Due to excellent results and a satisfying long-term relationship our existing client decided to extend the scope of our cooperation. Our client is a worldwide diversified technology and multi-industrial leader. It serves a wide range of customers in more than 150 countries. The company was established over 130 years ago and it operates through three business segments: Building Efficiency, Automotive Experience and Power Solutions. After our fruitful cooperation in Bratislava, we are extending the mutual cooperation. From now on our team will support client’s services from NATEK Delivery Center in Kosice as well as from Bratislava. Established in 2016, our Delivery Center in Kosice, Slovakia, is steadily growing. It now employs nearly two hundred highly skilled professionals, including project managers, system administration engineers and analysts. It offers a wide portfolio of services like deployment, migration, IT support, customer services and project management. 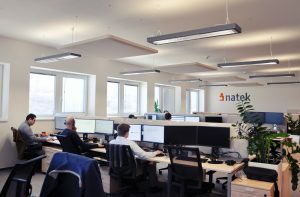 You will find more information on NATEK Delivery Center in Kosice here https://natek.eu/kosice/ .